As I mentioned in a prior article, Microsoft have managed to create some impressive AI capabilities in their Cognitive Services offering. Thousands of people at Microsoft have been developing this, and continue to do so. Of course such a huge investment deserves to be used. Apparently the Big Cheeses at Redmond have thrown down the gauntlet and challenged the product teams to integrate AI into their solutions as much as possible where it adds value. 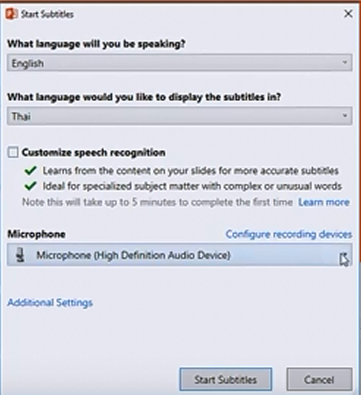 One example of this is a 'Garage Project' called 'Presentation Translator' which can perform real time multi-lingual dialog on a PowerPoint presentation in real time. To quote Wikipedia "The Microsoft Garage is a Microsoft program that encourages employees to work on projects that they are passionate about, even if they have no relation to their primary function within the company." There's a bunch of interesting projects at https://www.microsoft.com/en-us/garage/ and I encourage you to check it out. You can also choose to train the AI on your voice to get better results, which is probably worth it. This seems like really amazing stuff. The Cognitive Services Microsoft now offer such as Translation are very accessible, and can be stitched together in these amazing Mashup apps.